Nearly 2,000 Zambian villagers have the right to sue mining company Vedanta in the English courts, the Supreme Court in London said today. 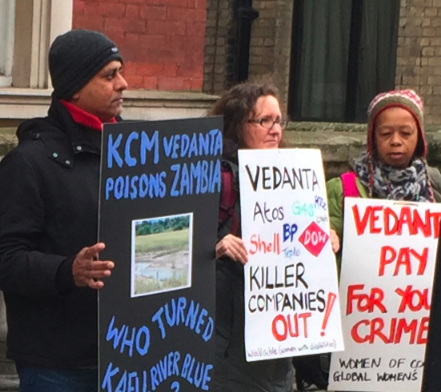 Vedanta, which operates as KCM in Zambia and delisted from London last year but maintains a legal base in Britain, appealed a lower-court ruling that a case in which villagers alleged their land was polluted by a Vedanta unit could be heard in England. The villagers sued KCM in London but KCM has been fighting to have the case heard in Zambia where they can easily bribe judges. But the UK Supreme Court said the Zambian villagers should pursue their case through the English courts. The villagers accuse KCM of poisoning their water through pollution. 10 April 2019. The UK Supreme Court has today handed down its decision in the jurisdictional matter argued before it in January 2019. Vedanta Resources Limited (Vedanta) and Konkola Copper Mines (KCM) had appealed the English Court of Appeal’s judgment released on 13 October 2017 that claims by Zambian residents against Vedanta and KCM related to KCM’s operations in Zambia could be adjudicated by the English courts. The UK Supreme Court has dismissed these appeals and held that the English court has jurisdiction to try these claims. The Supreme Court did, however, agree with Vedanta and KCM that England is not the proper place for the trial of these claims and overturned the lower courts on this point. The UK Supreme Court found that (whether or not an appellate court might reach a different conclusion upon a review of the same evidence) the High Court was entitled to conclude on the evidence before it that there is a real risk that “substantial justice” will not be obtainable in Zambia, and because of this, the claims may nonetheless be heard in the English court. The judgment of the UK Supreme Court is a procedural one and relates only to the jurisdiction of the English court to hear these claims. It is not a judgment on the merits of the claims. Vedanta and KCM will defend themselves against any such claims at the appropriate time. Great, Zambians need justice. We support the villagers and pray that they get the justice they cannot get in Zambia.mif I a UN Diplomat could be mobbed by lustful ev iis tribal UN staff members who admired my UN benefit entire ts and induced there relative lawyers and Judges to pillage me in abuse of the Judicial system….. And then the CONCOURT even conceals their illegal acts and conspires to with the culprits to further steal from me… What justice can this judicial system give to the poor Zambian villagers. We are happy with theUK Suoreme Court Judgement.. International justice is the only way fir Zambia….. We are also pursuing US Attorney General to file and enter fa Default Judgement, against a US Based Bank whose staff members were induced by the implicated Zambian UN staff member to funnel and spirit racketeering and money laundering acts through its system and then aided the Zambian lawyers and Judges to steal from a UN Dilomat…… Let there ge Justice against Vedanta……… They were hoping to abuse and corrupt the dysfunction Zambian judiciary in their continuos abiding of the judicial process. Thus case must shame the Zambian judiciary and serve as a turning point for its dysfunction… Us we just want international justice mechanism, because lawyers and Judges stole from us in abuse of the judicial process,myet Zambian national courts have no jurisdiction in calculating and discussing a UN Diplomat’s employment contract , salaries and benefits, but they did that inhumanely and ignorantly and stole friom the UN. DISCRIMINATION lo at. We demand that the UN Se T etary General convenes a panel to probe such banditry. Excellent news that ordinary Zambians are now permitted to pursue real justice in UK. Justice that of course should be attainable in Zambia itself, but because of the corrupt judiciary under Lying Lungu has to be sought abroad. The fact that Vedanta has spent so much time and money to prevent the UK route speaks volumes – they clearly are scared to be convicted in UK, while victory in Zambia would be almost ensured by conveniently bribing one of the judges. And, mark my words, there won’t be any comments from Lying Lungu, or one of his lying cronies, or one of his lying media channels (whether it will be ZNBC, Zanis, Daily Mail, Times of Zambia or any of the other ones. They will totally ignore this story……..